Polyethylene pipe can go by several names: Black Poly pipe, Blue stripe, HDPE pipe and PE pipe among them. Regardless of the name you know, it’s a very versatile and economic material of choice for many industrial, rural and irrigational pipework applications. 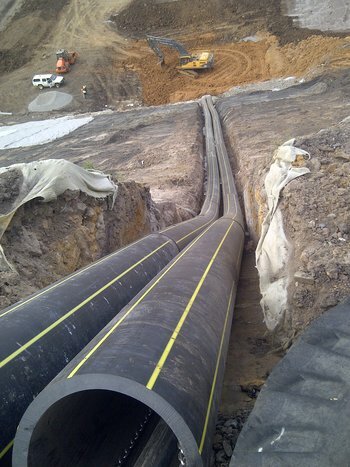 Air Energy is an experienced and specialist supplier, designer and fabricator of polyethylene piping for meeting a wide range of customer requirements. This pipe is so widely favoured among these sectors because of its flexibility, cost effectiveness and numerous other advantages over more traditional iron, cement and steel pipe systems. Air Energy can supply polyethylene pipe in various sizes, in coils or in straight lengths, which can reduce the need for fittings and joints. Consider this in addition to the cost savings that come from the flexibility in installation of this piping and it’s easy to see why it has become so popular. HDPE (high density polyethylene) – due to its high chemical resistance and abrasion resistance, this is used for conveying chemicals, potable water, compressed air, waste water and a host of other applications. LDPE (low density polyethylene) – Primarily used in micro irrigation, low pressure drip irrigation, rural irrigation and stock watering applications. If you’d like qualified assistance in choosing the best polyethylene piping for your specific need, or require an experienced professional to examine your existing PE pipe system, contact Air Energy today by calling (03) 9765 5600.